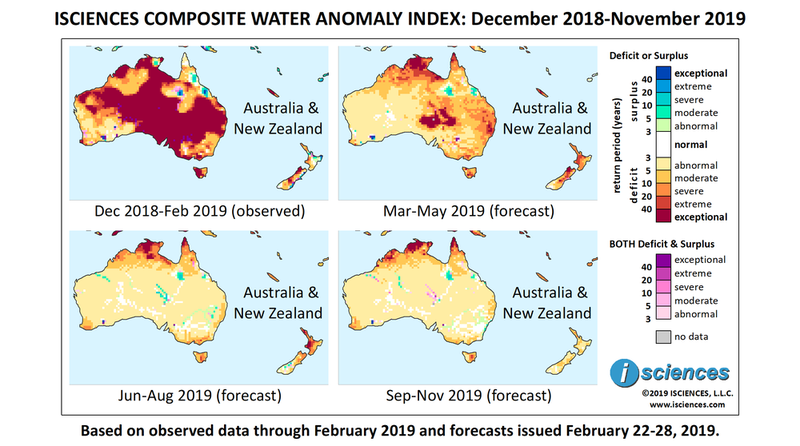 The 12-month forecast through November 2019 shows widespread, exceptional water deficits in Northern Territory and southeastern Queensland, and Kimberley and the Great Sandy Desert in Western Australia. Intense deficits are forecast along Australia’s southeastern coast from Adelaide past Melbourne, in Tasmania, and across northern South Australia into Queensland and New South Wales. Moderate to severe deficits are forecast for the southwestern tip of Western Australia and the Cape York Peninsula in northern Queensland. In the southeastern quadrant of the country, deficits are expected to be moderate on the Darling and Murray Rivers. Deficits in Derwent Estuary in Tasmania will be exceptional. Surpluses are forecast for northeastern Queensland south of Townsville and in northwestern Queensland east of the Selwyn Range. In New Caledonia, severe to exceptional deficits are forecast. Deficits of varying intensity are expected in New Zealand. The forecast through May indicates that the widespread, exceptional deficits that have dominated much of Australia in prior months will diminish considerably. However, a wide pocket of exceptional deficit is forecast in South Australia in the southern portion of the Lake Eyre drainage basin and along South Australia’s border with Queensland (QLD) through the Strzelecki Desert in New South Wales (NSW). Severe to exceptional deficits are forecast across northern reaches of the country from Kimberley Region in Western Australia (WA) through the northern Cape York Peninsula in QLD. Deficits will be exceptional in Top End, Northern Territory (NT). Deficits will be severe in a large block in the east from Rockhampton, QLD, nearly to Sydney, and will reach extreme or even exceptional intensity in the Northern Tableland of NSW surrounding Armidale. In southeastern Australia, deficits will be moderate on the Darling and Lachlan Rivers, but severe on the Murray. Primarily moderate deficits are expected in Victoria, but conditions may be severe around Melbourne and extreme east of Melbourne. Deficits will downgrade in Tasmania but will remain widespread and will be extreme near Hobart and along the Derwent River. Surpluses are forecast south of Townsville in northeastern QLD and in northwestern QLD east of the Selwyn Range. In New Zealand, deficits will increase as pockets of surplus disappear. Anomalies are expected to be severe to extreme with exceptional conditions in Tasman District, South Island. Intense deficits will persist in New Caledonia. From June through August, intense deficits will retreat to the north in Australia, persisting from Kimberley through Top End, NT and the northern Cape York Peninsula, and leaving primarily mild anomalies throughout much of the remainder of the country. Moderate to severe deficits are forecast for the southwestern tip of WA, Victoria’s coast, and Tasmania, where deficits will be extreme around the Derwent River. Some moderate deficits are forecast in eastern Victoria. Surpluses will shrink but persist south of Townsville, QLD; will persist east of the Selwyn Range, QLD; and will emerge along some rivers in the center of the country east of Alice Springs, along the De Grey River in WA, and some small pockets in the eastern Murray-Darling system. The forecast for the final months – September through November – indicates that intense deficits will persist in far northern Australia. Deficits of varying intensity are forecast for Tasmania, the tip of WA, pockets of New Zealand, and New Caledonia. Two weeks of extreme monsoonal rains flooded northeast Queensland in late January and early February, killing at least six people and causing an estimated A$957 million (US$1.1 billion) in insured property damages. The deaths were attributed to drowning and bacterial infection from flood-stirred soil. The government of Queensland was forced to open the Ross River Dam spillway, flooding around 2,000 homes, and issued warnings to residents that crocodiles and snakes had been reported in floodwaters of Townsville suburbs. Up to 300,000 cattle were killed in the floods, whose rainfall totals were described by local officials as rarer than once in 500 years. As the massive floodwaters drained from Townsville watersheds, hazards transferred from land to the Coral Sea. Carrying sediment and excess nitrogen and phosphorous, the floodwaters threaten to smother the Great Barrier Reef, a United Nations World Heritage Site, by inhibiting light penetration. Experts emphasize that the pollution disturbance is only one of a sequence to hit the reef in recent years, including bleaching events and cyclones. Down almost 4 million metric tons from the prior season, Australian wheat production dipped to an 11-year low in the 2018/19 season due to drought across New South Wales and Queensland. Sowing for the 2019/20 season begins next month. New South Wales graziers were warned last month that drought-stressed sorghum, feed for cattle and sheep, could contain unsafe levels of prussic acid, threatening livestock. Sorghum produces prussic acid, hydrogen cyanide, during drought conditions and fodder with high levels can poison stock, resulting in respiratory stress and other symptoms.. The United Nations Children’s Agency warned recently that prolonged drought in eastern Australia is taking an increasing psychological toll on children in the region, who are growing up in stressful home environments and working more, leaving less time for school and play. Last month New Zealand suffered its worst fire since 1955. The bushfire in early February burned over 5,600 acres in the northern region of South Island, prompting the declaration of a state of emergency and the evacuation of thousands of residents. The fire followed a heatwave amid conditions that the New Zealand Drought Index described as “extremely dry.” One expert in rural economics said that drought in New Zealand’s most important dairy-producing areas could have contributed to the global spike in dairy prices by 6.7 percent.